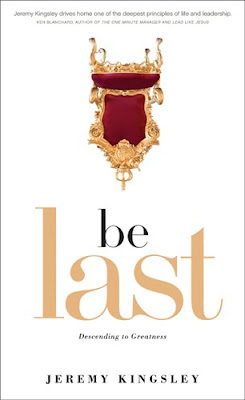 Be Last by Jeremy Kingsley. I heard Jeremy speak several times at a Youth conference in Pigeon Forge, TN this past January (can I hear a - Runnnnnn's house - - inside joke). He is a great speaker. He took wonderfully deep, important concepts about life and brought them into focus for a room full of loud teenagers (and a few adults)! In the first chapter he brings to life a thought in me that I, like a lot of people, have thought of or heard someone tech about before but for me it opened the door a little more and got me wondering "Why, Jesus?". Why did Jesus come to earth when he did? Imagine a part heaven as it's described for us in Isaiah 6. God is surrounded by six angels that are in the room saying "Holy, Holy, Holy........" all day long everyday since the beginning of time until forever! Their entire job in their existence is to joyfully praise God and tell him how wonderful he is. Hard for us to understand but they actually desire to do this rather than taking time off for a vacation or rather than going out for a Latte with some friends or taking a great trip to the most amazing part of the universe. They want to stay with God telling him how great he is! Then cut to the next day. This same God who is at the peak of fame, is given all the honor and praise that Heaven can produce shows up on earth in a barn with animals and hay and dirt in the middle of the night in a city that is so packed with people that there is barely room for him and his unwed mother and blue collar father and in the middle of all of this a bunch of dirty smelly shepherds (who by the way are like social lepers) who come and want to see him. He's born on the street without a home of his own and this is the same God that created the street and the city and the country and the planet and the universe that it all exists in! Why pick this place? Why, Jesus did you come when the largest super power on the planet was ruling over the nationality that you were born as. A Jewish child born in one of the worst times to be a Jewish child! There's no cars, planes, air conditioning, excellent modern health care, or child protection laws. Why, Jesus did you come and spend all of your time with the people that you did? Hanging out with tax collectors, prostitues, lepers, dieing and dead, sick and blind, poor and forgotten. Telling people to not tell about what you have done for them but simply to go and stop thier sin. No self promotion, no big plans to gather armies, no apparent plan (until the end). The God that could have brought an army of angels clothed in gold and just gotten rid of it all and reigned as a king as you deserve. You could have come today and accomplished the same thing. You have told us why you came (which seems incredible as well). But why didn't you come today or in the future when technology and society might could have afforded you a little easier life? Why just hang out with really undesirable people? Why not the middle class or members of a small church that wants to grow into a larger church? I really don't know the answer, Jesus. But somehow I think that it is more important than I have realized before. Maybe more core to my faith and my life even after so much time and even after being so far removed from your life than I have realized. Is it a riddle or a deep theological answer? An answer that will take my entire life of reading every book or listening to every speaker or struggling with all of my life to discover the deep hidden or guarded meaning? Or is the answer as simple as the words you spoke and the life that you lived? Maybe these examples will fill the void in my life - the longing for more stuff that I have - the longing for something new to do or the longing to get deeply interested in and sped my time and money doing. The answer to the questions of life. I really do wonder - Why, Jesus?